It's been just 12 years since the Detroit Lions moved to Ford Field, a stadium constructed for the NFL team in downtown Detroit. 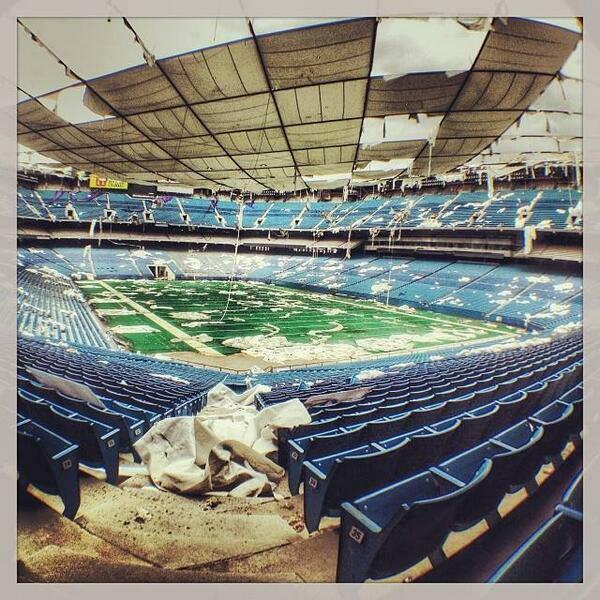 But the Pontiac Silverdome, the Lions' old haunt, has quickly fallen into disrepair. 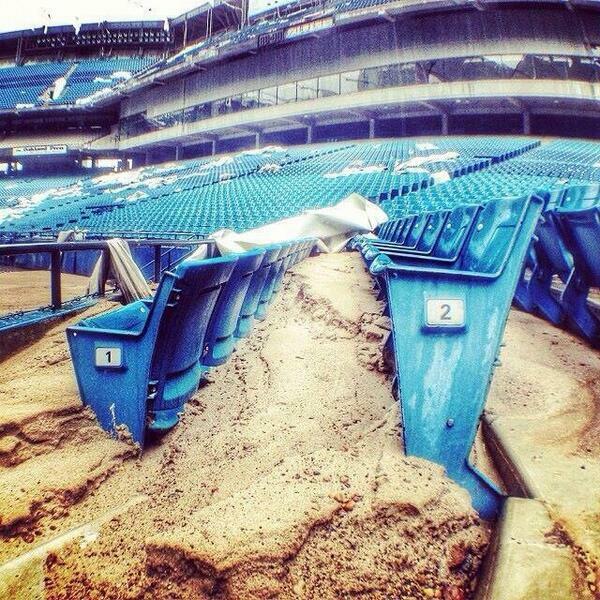 WDIV-TV's Alex Atwell explored the stadium and found a somewhat dismal scene. Atwell was at the stadium as fans came to pick up seats they had purchased as memorabilia. An online auction is planned for mid-May, selling off the stadium's assets, from a scoreboard to toilets, a popcorn machine to a sauna. There's been extensive damage to the Silverdome's roof, shown in chopper footage from WXYZ-TV last year and in the tweet below. 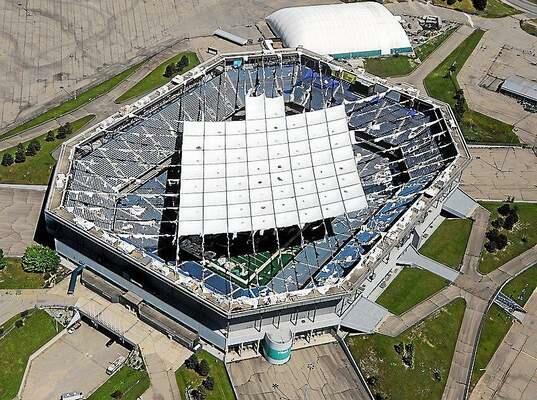 The Silverdome was built with public funds in the 1970s. 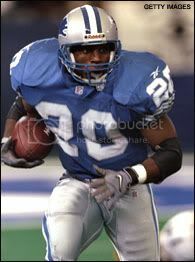 Though the Lions left for Ford Field in 2002, the site was a venue for concerts and other events in years after. In 2009, Canadian developer Andreas Apostolopoulos' company Triple Properties Inc. purchased the property for $580,000 -- a fraction of its $55.7 million cost. Triple Properties has not disclosed what they plan to do with the site. But no matter what happens to the Silverdome, or where the Lions play, one thing remains constant: Detroit fans are still, always (no matter how unreasonably), absolutely positive that this is the year they'll get to root for their team in the Super Bowl. Entirely the fault of the Pontiac Stadium Authority, the group that REFUSED to renegotiate the deal with the Lions, and after the Lions left they tried to play hardball with potential buyers and expected to get premier return on a property that wasn't making money. What a bunch of idiots. The people in the city of Pontiac should have skewered those responsible. But we should have known it was going to fall into disrepair. the old owners wouldnt even fix the turf when it was comming apart. they had to delay at least 2 games to fix it mid games in its final year. Favorite memory: November 27,1997 (Thanksgiving Day). The Lions played the Bears. Barry ran for close to 200 yards, scored three touchdowns. Lions were down 20-17 at the half. Barry scored on a 40 yard run before the half to close the score and make it a 3 point game. My buddy turns to me and says 'Let the beatdown begin'. The Lions score 38 points in the second half, and the defense completely smothers the Bears offense. Close second was the 1998 Turkey Day game against Pittsburgh that went into overtime. Jerome Bettis says 'Heads' on the coin toss, but the referee tells him he said tails. He CLEARLY said heads, and the coin came up heads, but the referee insists he said tails. Lions get the ball, go down the field, kick a FG for the 19-16 win. Controversial. Oh Man I remember that game! Yet another rule change influenced by Detroit Lions football! You know, they could take what is left of the roof off, clean it up and use it for outdoor events. Maybe even bring a soccer team to play there. Soccer and Lacrosse are the 2 fastest growing sports amount youths in America. Then there is always outdoor concerts and monster trucks. Also a perfec venue for an NFL Developmental league team. Just need a few entrepenuers to work with the NFL TO MAKE IT HAPPEN. My first ever Lions match attended in person. The Lions played the Bears. A win would put them into the playoffs. Bears hit a last second field goal from 50+ yards. In the off-season, the Lions move to Ford Field and hire Matt Millen. Basically, I think I'm personally responsible for a decade plus of Lions futility. I am the albatross around the team's neck! But we should have known it was going to fall into disrepair. the old owners wouldnt even fix the turf when it was comming apart and here is Phen375 which has helped me lose weight. they had to delay at least 2 games to fix it mid games in its final year. Damn. $580k seems like a right bargain when they could just tidy the place up and rent it out for converts. Very sad to see something so dead and empty when it was once filled with life. Would make a great setting for a Zombie movie though. Last edited by 9Lion on May 16th, 2016, 1:38 pm, edited 2 times in total. As a stadium the Silverdome was pretty horrific, to be quite honest. It was like a concrete prison. Walking the concourse reminded me of the future scenes from the first Terminator. There was always at least one major drunken fight in every section at least once a game, sometimes maybe more often. I do miss the parking lot and the more concentrated tailgating, though. The Lions played the Bears. Barry ran for close to 200 yards, scored three touchdowns. Lions were down 20-17 at the half. Barry scored on a 40 yard run before the half to close the score and make it a 3 point game. My buddy turns to me and says 'Let the beatdown begin'. The Lions score 38 points in the second half, https://arynews.tv/en/category/pakistan-elections-2018/ and the defense completely smothers the Bears offense. Never got to go there. Drove by it a million times, but that was it. Really regret not making it a point to.